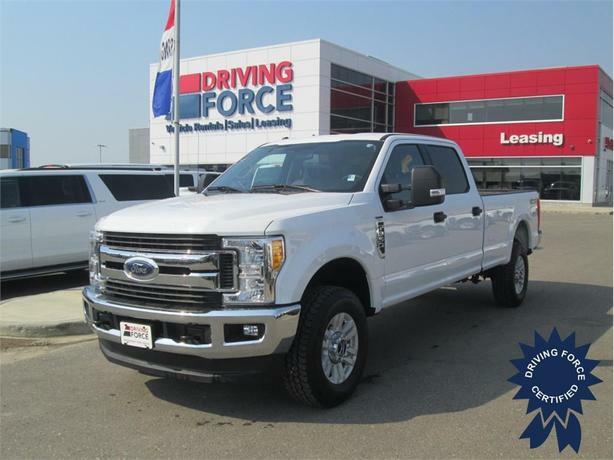 This 2017 Ford F-350 Super Duty comes with a 176-inch wheelbase, power-adjustable gas and brake pedals, 6 upfitter switches, reverse sensing system, 8-way power driver seat with lumbar adjuster, fog lamps, tailgate step and handle with tailgate assist, transfer case and tailgate assist, extra heavy-duty 200-amp alternator, XLT Value Package, cloth 40/20/40 split bench seat with recline, 18-inch sparkle wheels, TorqShift 6-speed automatic transmission with over-drive, HD shock absorbers, front anti-roll bar, firm suspension, hydraulic power-assist steering, single stainless steel exhaust, auto locking hubs, front suspension with coil springs, leaf rear suspension with leaf springs, full-size spare tire stored underbody with crankdown, SYNC Communications and Entertainment System, enhanced voice recognition, 911 Assist, 4.2-inch LCD screen in centre stack, AppLink, 1-smart charing USB port and steering wheel audio controls, 4-way driver seat and 4-way passenger seat, power windows, cruise control with steering wheel controls, manual air-conditioning, three 12 V DC power outlets, and front and rear map lights. The GVWR rating is 11,500 lbs (5,216 kgs) and has a 3800# Maximum Payload. The 6.2-litre V8 gas engine provides 385 horsepower at 5750 RPM and 430 lb-ft at 3800 RPM. Message us for further information about this unit or to inquire about financing options that fit your needs.